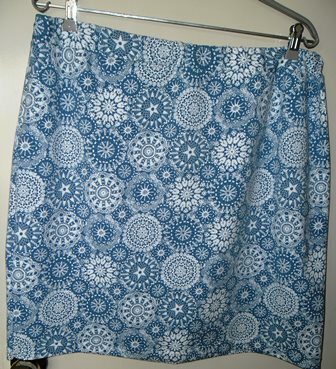 I have completed my skirts for the Pattern Review One Pattern Many Looks contest. 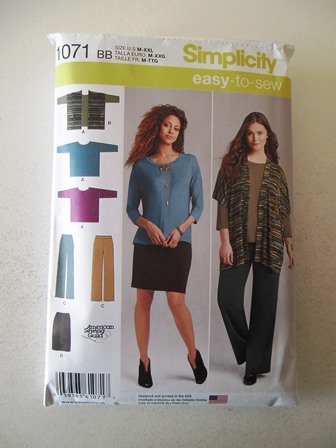 The pattern I used was Simplicity 1071, after doing my test skirt to check the size I have made the skirts in XL. 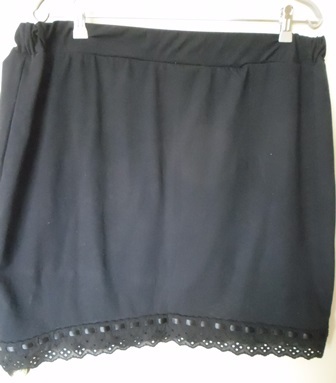 For my first skirt I used a cotton lycra called Pigeon Lace by Tyglycka. It was love at first sight when I saw Zebra Fabrics post a photo of this fabric on Facebook. I am not a white person but this print is amazing. The piece is 180cm wide too so you are really getting your money’s worth from it. It feels so soft and light. For the hem I used my coverstitch machine. I wanted to keep it very simple. Sadly my tension may have been out a bit or I hadn’t feed the fabric through smoothly so my hem isn’t sitting flat. It isn’t a total disaster as it looks like a pin tuck finish. 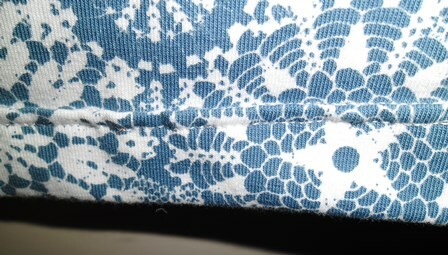 As the print is so busy really it isn’t that noticeable as you don’t really see the stitching on the hem line. 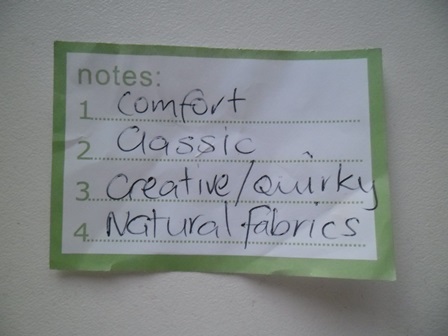 I brought this fabric with the intention of making this skirt. I purchased a little extra than the pattern required so hopefully I will have enough to make a matching top. For my second skirt I used some black cotton lycra I found in my stash, most likely I brought it from Spotlight last year. It has a slightly heavier feel to it. I wanted to make a classic black skirt. To add a little interest to the skirt as classic doesn’t need to equate to boring I added a trim to the hem line. To attach the trim piece I first did a double folded hem and secured it with a row of stitching – confession I just eyeballed it and didn’t get out my hem gauge to check it was even. 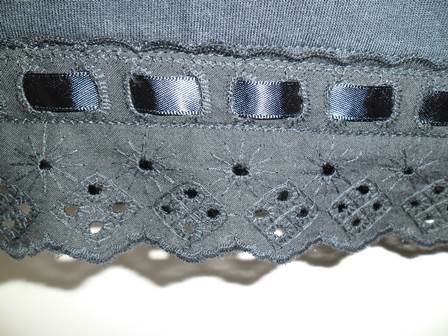 I pinned the trim onto the folded area and did a row of stitching either side of the ribbon detail. I wasn’t sure how stitching a firmer piece of trim onto a stretch fabric would go but the hem line doesn’t stretch and this is a heavier fabric so it works well. I love the trim piece and can proudly say I made it up myself. 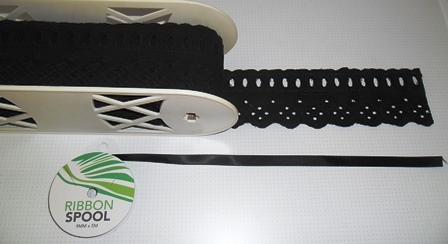 At the ASG Simplicity Industry Day this year I picked up a roll of black cotton lace. I weaved some 9mm satin ribbon through the eyelet holes in the lace. I love the combination of them both. They both add interest to the skirt. The ribbon was the only thing I needed to buy in making these skirts as I had everything else already in my stash. The skirt pattern itself is so simple to make up – a front, a back and 2 pieces for the waist casing. It is a great pattern to have in your stash as it is so basic you can change it around by changing the fabrics or trims or length of the hem.